Danish 830 standard silver napkin rings pair, date marked for 1878 and maker′s mark script H, assayed in Copenhagen by Simon Groth. 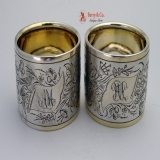 Each of these gilt interior and rim napkin rings has floral engravings on a matte finished body surrounding a banner shaped cartouche, monogrammed AM and VM. Weighing a total of 62 grams or 2 ozs. Troy, each is 2" in diameter and 1 1/2" tall. Monogrammed as described above, the soft, warm, original finish is present, with no buffing or machine polishing. The excellent original condition and clear detail, with no removals, repairs or alterations, make this an especially attractive offering.